Trying out the new contactless payment system. Photo: Gabriela Szymanowska. Posted March 21, 2018 by Jade Morellini & filed under City News. 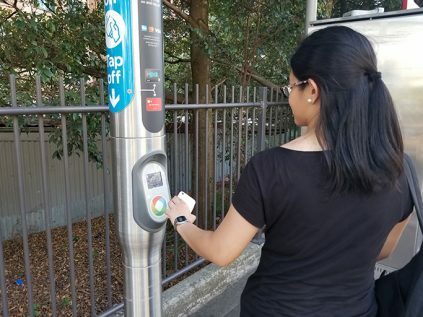 Recent developments for the Opal card means NSW commuters will be able to use alternative methods of payment for travel such as smartphone, tablets, smartwatches and credit cards. The alternative payment issues have been introduced to overcome issues including queues for topping up cards and convenience for interstate and overseas visitors, but these conveniences may come with a security risk say industry experts. Ahmed Khanji, Chief Executive Officer of Gridware, explained how contactless payments opens more risks for commuters. Gridware is an Australian cybersecurity company that focuses on securing business information and preventing cyber-attacks. “When you are checked at your receiving station, the guards can identify if you are the owner of that Opal card, whereas if you pay with contactless payment you can use essentially any card. You’re not provided with a receipt on the spot, so there’s essentially no way to track exactly who and what used what card at what time,” Mr. Khanji said. Opal cards use the near-field communication technology or NFC, that allows for two-way communication between the chip in the card and a card reader, the same technology used in credit and debit cards. Mr. Khanji said that contactless payments present opportunities for people to implement a relay attack, which manipulates the reading between the NFC tag and the reader by using a card emulator on top of the original card reader. These fake readers can either manipulate the transaction or collect people’s authentication keys, which can later be replicated. In 2017, Transport for NSW started a trial on the Manly to Circular Quay ferry which allowed commuters to use their credit or debit cards for a single fare ride. The system was integrated in hopes of making it easier for tourists, who make up 40 per cent of the passengers. “The integration of contactless transport payments into the Opal ticketing scheme is about choice and convenience. We want to continue to provide a convenient solution to those who may not have an Opal alternative card, whether they’re tourists or simply infrequent public transport users,” a spokesperson from Transport for NSW said. The system has been extended to all ferries and the Inner West light rail, so commuters can conveniently use their credit cards or a device that is linked to a card to purchase single Opal fares. Sasha Miles, a tourist from Singapore, said it was her first time venturing out into the city and that using the transportation in Sydney was easier to navigate compared to New York City. “It’s pretty straight forward. The people at the station helped,” Ms. Miles said. Peter and Katarina Zahradnik, tourists from the United Kingdom, said that the system is like the Oyster card in England and that they had no trouble finding stores where they could top off their cards. The new method will not include the benefits that exist with current Opal cards, which are designed to reward commuters who use transportation daily. These benefits include a weekly travel reward and travel discounts. Once commuters complete eight paid journeys between Monday and Sunday, the rest of the fares that week are half-priced. For a trip on an adult Opal card commuters using different modes of transport with a journey receive a two-dollar discount for each transfer to a new mode of transport. Contactless payment has not yet been extended to buses or trains but should be extended to all modes of transportation by the end of the year.